Inkaholiks is an award winning tattoo shop in Miami, Florida. The specialists here are experienced and talented in body art, piercings, and tattoo. When making the commitment to place a tattoo on your body, no matter how large or small, it will play a large part in your life – you should rely on the experts at Inkaholiks tattoo shop. The artists here can do neo-traditional, water color, black/grey, color realism, and black work. They will assist you in making the best choice for your body and lifestyle – meeting with your expectations and visions. You can see many examples of Inkaholik’s great work is available on the shop album, here. These photos show the unique neo-tradition style, highlight black outlining and detail, filled in with bright colors resulting in a professional and finished look on skin – no matter where you place the tattoo. From anime characters to traditional flowers, this style can used with any image and will make your piece truly stand out. Even Disney characters (check out Mickey in the gallery) look great in this tattoo style! Before getting your new tattoo, spend time searching our gallery and Instagram for ideas. While you don’t want to copy another person’s (and artist’s!) work or idea, you will get a great idea of what kind of image works, and doesn’t work…and where you might want to place your new tattoo. Search using our shop name, or your tattoo idea, and many images will come up – but don’t feel limited by looking only at tattoos. Some of the best tattoos are modifications of pieces of art (paintings or photographs) or other visual mediums. Once you have an idea, reach out to us for a cost estimate and time estimate. You don’t want to be surprised with how long a piece takes – or how expensive it might be. We can give you an estimate before you come in! We can also give you suggestions as to what to wear and how to prep your skin (and yourself) for your new tattoo. An important part of making your tattoo looks its best is aftercare. A beautiful tattoo can turn in to a disaster if you don’t take care of it – and you not taking care of it is not something your artist can fix. First, don’t mess with the bandage. Your new tattoo is covered up to protect THE OPEN WOUND from bacteria. You might want to share your new piece with your friends (or gaze at it yourself). Have your artist take a picture before it is wrapped – don’t unwrap it. This minimizes the risk of infection and damage. After you remove your tattoo’s bandage (the length of time depends on the tattoo – ask your artist) you will want to (and need to) wash your tattoo. Use lukewarm water (not hot and not cold) and a basic (scentless) soap. GENTLY wash away any ointment, blood, or plasma. Do not use a washcloth, anything abrasive, or a direct flow of water to scrub your tattoo. Just carefully go over the area with your hand and the gentle soap. After washing, gently pat the area dry (DO NOT RUB). Use a clean white cloth or paper towel and get it completely dry. Follow this with a light application of a scentless lotion (we sell a great one in the shop). Continue this for about two weeks while your tattoo scabs and dry skin flakes off. Do not pick at your scabs and do not scratch your skin – if the itch is bad, try patting your skin. Once your tattoo heels, enjoy the bright colors and vivid design. Make sure to apply sunscreen when you spend time outdoors – this will protect the skin and help keep your tattoo looking fresh. Taking care of your tattoo like this will help it last and minimize the need for retouching. 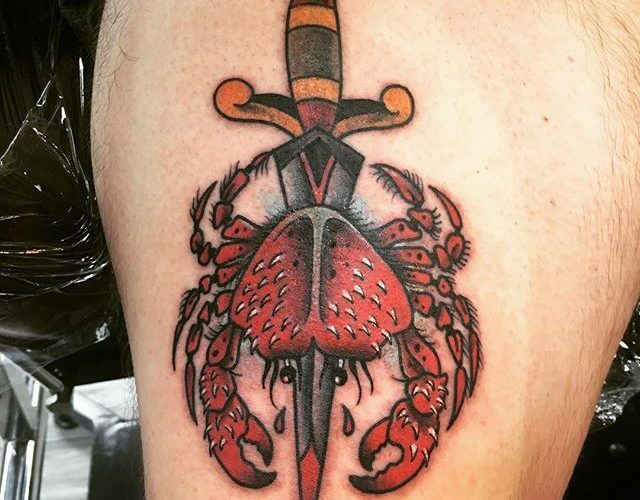 If you are thinking about getting a tattoo (neo-traditional or other style) consider coming in to any of our shops, Miami’s best, and talk with an artist today. We can help make your dream a beautiful reality that you will cherish for many years.